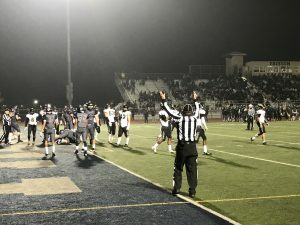 In a flash, during the North Coast Section Division 1 semi-final game last Saturday night, Freedom’s Giles Jackson shattered the hearts of many Antioch High football fans and players, especially the seniors, as his seven-yard run in overtime helped seal the ticket for the Falcons to win the game 45-39. 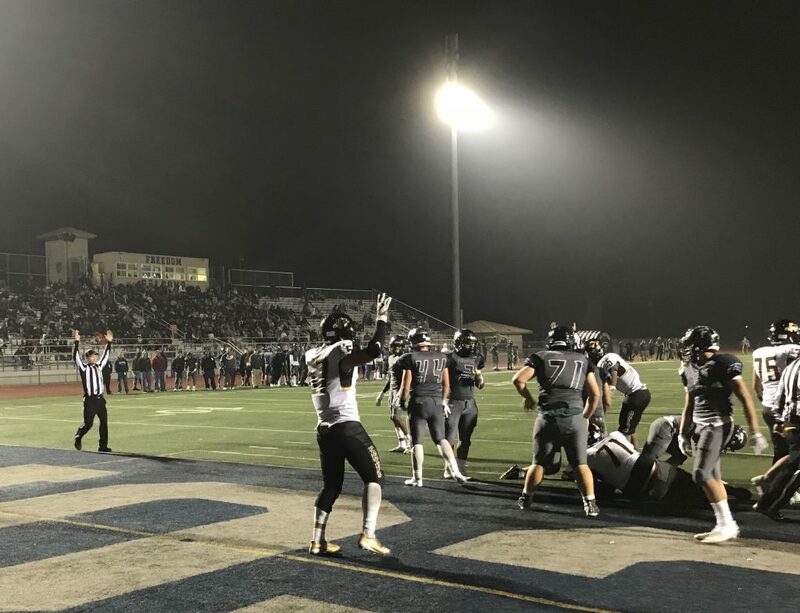 They advance to their first ever NCS Division I championship game and will face Brentwood’s Liberty High Lions in their first championship appearance in over 100 years, at Heritage High, Saturday night, Dec. 2. Freedom’s Giles Jackson runs it in for a touchdown in OT winning the game 45-39. They head to the NCS Division 1 Championship game for the first time ever as the song “Hang on Snoopy” played over the loudspeaker at the Falcons’ stadium. Many of Antioch’s players had their heads down, with tears running down their eyes which is perfectly normal reaction to have. Especially when some of these players will never be able to play another snap of football in a black and gold uniform. According to the experts, Antioch was not supposed to get this far. The Panthers were not supposed to receive a number three seed in the NCS playoffs. Let alone, Antioch was not even supposed to win two games. But they did, and they should be pretty satisfied with this season for shutting all the doubters up. Najee Harris is a familiar name throughout the entire Bay Area, but Antioch is not a one-player team. They clearly asserted that with their performance. Offensively, they had Dalaan Green getting a majority of the carries leading the team in rushing with 1,059 yards, followed by athlete Omari Harris backing him up when it came to power drives. Antioch scored again tying the game at 39 with 3:40 left to play. The Panthers were going to attempt a 2-point conversion. But with two penalties totaling 20 yards Antioch chose to kick and it was blocked again, for the third time in the game. However, Willem Karnthong was the best of both worlds. Not only did he break the record for the most career touchdowns in Antioch history, but he is on pace to break the record for most career touchdowns. Essentially, making him the statistically best quarterback in Antioch’s history. And he has a whole campaign left in him. He had a plethora of options to throw to, including junior Gaudie Campbell and senior Isaiah Avery. Defensively, Antioch had one of the most dangerous offensive lines with Garrett Robinson and Timmy Dorsey. In fact, Robinson was robbed out of the Bay Valley Athletic League MVP award. The achievement instead went to Liberty’s Nicky Einess. The most impressive performance by Antioch was during the Big Little Game against Pittsburg. Yes, they lost 14-12, but they were the team that came closest to beating the BVAL champs. Pitt beat the two teams in the championship game, blanking Liberty 35-0 and besting Freedom 47-32. The Panthers will come back strong, fierce and hungrier than ever to win next year’s BVAL title. Antioch will have plenty of weapons remaining in their arsenal including junior linebacker and tight and Vinny Ballardo, along with sophomore DeJuan Butler. This entry was posted on Thursday, November 30th, 2017 at 12:42 pm and is filed under News, Sports, Youth. You can follow any responses to this entry through the RSS 2.0 feed. You can leave a response, or trackback from your own site.